December 19th was a big day for financial markets as the US Federal Reserve provided its decisions after a two-day meeting. Markets had been waiting for weeks to see if the Fed will loosen its monetary policy as the global economy begins to show signs of weakness and unfortunately, those expectations had not been met. The post USDZAR jumps following the Fed meeting appeared first on The South African. The US central bank raised its benchmark interest rate a quarter of a percent, as expected, but it lowered the guidance for next year at two expected interest rate increases when the market was expecting just one. The South African Rand weakened against the US dollar following the news and press conference, where Jerome Powell provided a less-than-expected dovish tone. 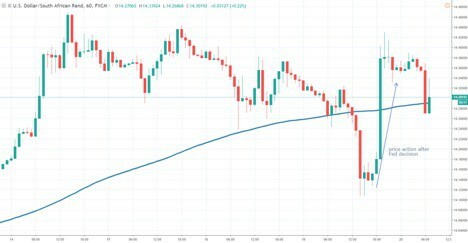 Online trading activity spiked higher after the event and the USDZAR quote jumped from 14.13 to 14.40 in less than 3 hours, as you can see in the chart below. Emerging currencies had been under pressure in 2018 against the US dollar, as the Fed raised rates four times. Since the dollar is the world’s reserve currencies and countries across the globe need liquidity to finance their activities, the monetary policy in the US had been widely criticized for dampening the growth prospects for emerging economies. The South African Rand started to weaken significantly against the US dollar since March 2018, when it was trading around 11.62 and reached a yearly high around 15.78 in September. Although there is a majority of analysts very pessimistic about the Fed’s ability to continue on the same tightening path, the remarks provided yesterday could provide some additional boost for the US dollar. All three major indices had weakened substantially after the Fed news and are now down around 15% from the all-time highs reached a few months ago. Raising rates further will contribute to the appearance of a rare phenomenon called as “inverted yield curve” when short-term rates are higher than long-term ones. We already see 1-year, and 2-year rates higher than 5-year and this is one of the most important drag onasset prices in the United States. Emerging markets, including South Africa, will need a weaker US dollar and fortunately, the upside for the US currency is more limited today as compared to a year ago. Despite the latest comments, the Fed won’t be able to tighten monetary further without hurting asset prices and this is expected to be the main concerns starting with their next meeting.